I will be making Valentine's lunches occasionally before Valentine's Day and of course there will be a lot of baking going on around here. :) I think heart shaped cookie cutters are the easiest and quickest way to create a fun lunch. 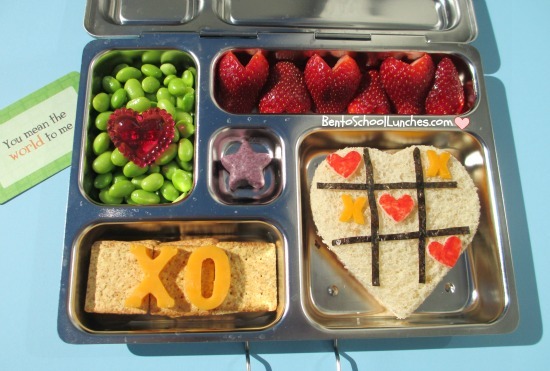 Main compartment - Valentine's heart tic-tac-toe for which I used a heart shaped cookie cutter for the sandwich with nori for the lines, mini heart shaped Asiago cheese colored with red food safe maker and X's are Colby longhorn cheese. Upper left - Edamame with a heart shaped cupcake ring. Upper right -Strawberries cut into heart shapes. Such a cute lunch Rina! I love this lunch! So much fun! !